Administrators for high-street photo retailer Jacobs have closed the chainu2019s remaining stores, bar one which will remain open, temporarily, to deal with stock clearance. Jacobs has today shut 11 stores with the loss of a further 87 jobs. The Jacobs branch at London Road in Leicester will remain open to handle stock clearance, until a date yet to be confirmed, according to the firm’s administrator PKF. In a statement, PKF said: ‘The remaining 11 stores in the group will close today with the loss of 87 jobs after a buyer for the business failed to materialise. Eddie Kerr, a partner at PKF, added: ‘This is a terribly sad situation, to see a long-established family-run business close down. ‘Unfortunately, this is an increasingly frequent situation, particularly in the retail sector, where trading conditions have never been tougher. Jacobs went into administration on 1 June. Customers should deal directly with manufacturers regarding product warranties, according to PKF. Amateur Photographer (AP) understands that administrators had hoped to sell the business as a going concern to photographic dealer Calumet, but negotiations collapsed yesterday. 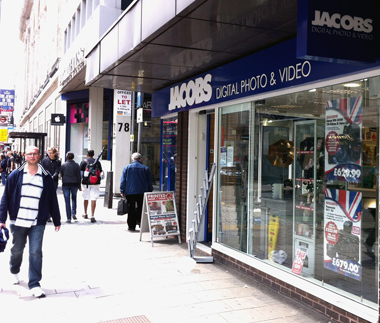 On 8 June Jacobs shut down seven of its 19 stores and axed around a third of its 154 staff. The family-run business was founded in 1939. AP understands, from sources close to Jacobs, that the company’s flagship store in Leicester is to remain open to deal with stock clearance. Accountancy firm PKF, which is acting as Jacobs’ administrator, is set to release an official statement later this morning.